Hard hits. Blocking shots. Killing penalties. Sending the Vancouver Canucks to the Stanley Cup Final. His game isn't defined by just one skill. And that's what makes Kevin Bieksa one of hockey's most dangerous and respected defencemen. Need a player who can log big minutes? What about one who can add some timely offence? How about a rearguard that can alter the tone of a game with a big body check? Or perhaps the player that scores the double-overtime tally in Game Five of the 2010-11 Western Conference Final? If you required all those elements in a player, the man who wears the No. 3 jersey for the Canucks can deliver on all fronts. Bieksa and the Canucks, who find themselves one step away from winning the Stanley Cup after a five-game triumph over the San Jose Sharks in the Western Conference Final, have rolled with the punches in the 2010-11 NHL Playoffs, including a resilient performance against their recent nemesis, and biggest rival, the Chicago Blackhawks. After taking a seemingly commanding three games to none lead in the first round of the Western Conference playoffs, Vancouver needed an overtime goal in Game Seven from Alexandre Burrows to complete the series victory. While there was plenty of panic coming from their supporters, Bieksa recalls a different atmosphere in the Canucks' dressing room after their lead disappeared. After a six-game series win against the Nashville Predators in their Western semifinal matchup, Vancouver bested conference's No 2. seed, the San Jose Sharks in an entertaining and high-paced five game series, earning the clinching victory on a Bieksa double-overtime goal in Game Five that sends the Canucks to the Stanley Cup Final for the first time in 17 years. Bieksa, who played four standout seasons at Bowling Green University in Ohio, knew just what to expect from the opposition. He also understood what was expected from himself and his teammates. You also require contributions from every player on the roster, something that has been a hallmark of the Canucks' Cup run this campaign. Bieksa, who missed 15 regular season games with a broken left foot, has done his part to put the Canucks in prime position to bring the franchise its' first championship. His combination of toughness, tenacity and timely points has made him one of Vancouver's most high-profile performers and undoubtedly one of their most important players. Through three rounds, Bieksa has nine points, along with a plus-10 rating. 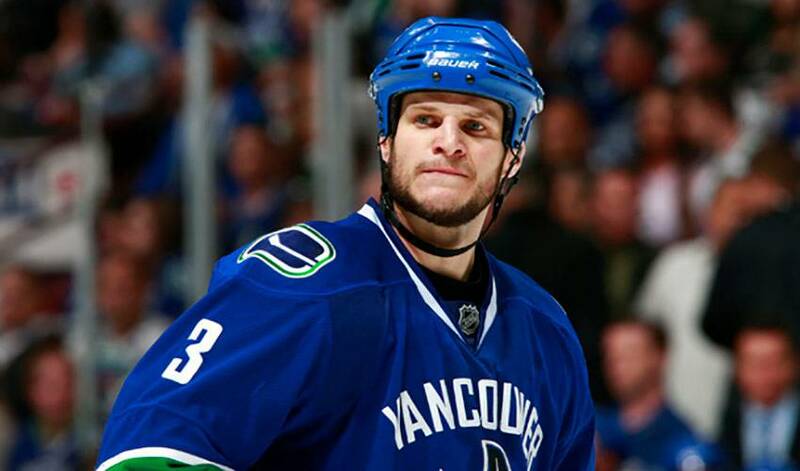 Bieksa doesn't need to be reminded that they have a loyal legion of fans backing them. With only four more victories between the Canucks and their ultimate goal, Bieksa is hoping that Vancouver's fans have plenty more reason to cheer by the time the playoffs come to a close.